2017 NEC Handbook Toolkit - Exclusive from NFPA! Get the 2017 NEC straight from the source and save with our exclusive Toolkit Bundle, $250 value for only $204.50. With new technology driving the future, you need tools that keep up. Make sure you're compliant with the latest changes to the 2017 NFPA 70®, National Electrical Code® (NEC®). The NEC is used in some way in every state in the U.S. and reflects new technologies in renewable energy and energy storage, revisions in requirements for electrical wiring, overcurrent protection, and installation of equipment, and other crucial updates. Save 20% with our exclusive NEC Handbook Toolkit Bundle, valued at more than $250, for only $204.50! 2017 edition NEC Reference Cards. NEC Reference Cards provide fast and easy access to 13 essential NEC tables for electrical contractors and installers. Keep installations right on the money with durable waterproof NEC Reference Cards. FREE! NEC Abbreviation of Terms Cheat Sheet PDF. Your handy source for must-know electrical terms, from AFCI to WR and dozens of terms in between. All you need to know about the National Electrical Code®, from the people who know all about it! Order this valuable 2017 NEC Handbook Toolkit today! 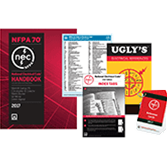 NEC and NFPA 70E Handbooks Toolkit - Exclusive from NFPA!